Why oh why do we have to have sidewalks on Federal Hill? Nice headline, huh? OK, we need sidewalks certainly, but why do we have sidewalks along the alleys that thread between buildings in the Atwells Avenue area? 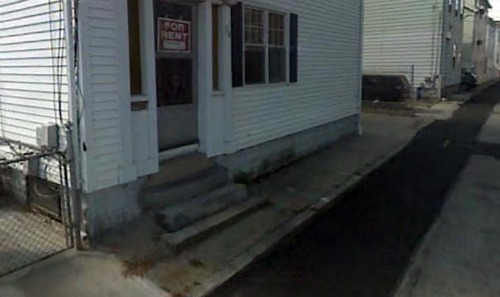 Writing the post on the 50 Cedar Street proposal had me zooming down Jones Street via the Google Machine. What is even the point of those sidewalks? Is someone in a wheelchair supposed to find those sufficient, someone pushing a stroller..? Federal Hill is littered with these alleys with these substandard sidewalks. Why are we trying to force a roadway, curbs, and sidewalks into a space where they just won’t fit? I’m all about seeing the alleys on the Hill transformed into Woonerfs. A Woonerf is a Dutch traffic calming concept where controls are removed and all road users share the space equally. On a street like Jones Street, that connects nothing to nothing and has almost non-existing vehicular traffic, it seems a no brainer to remove the sidewalks and make the road one open space. Some safety measures such as strategically placed bollards would be employed to keep cars from ramming into buildings, but otherwise, just let all users mingle. 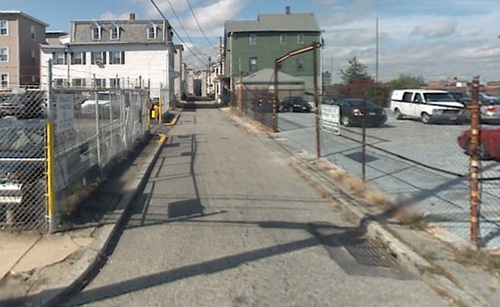 I live on one of these Federal Hill alleys and no one uses the sidewalks, so why have them? A Woonerf can even be green. Woonerfs typically have pavers to make them look different from a regular paved street. The pavers give a cue to the driver that this is a special place and that they need to pay attention to other users. Those pavers could allow portions of the roadway to have a permiable surface, allowing rain water to soak into the ground, rather than running off into drains and eventually the rivers and the bay. Areas previously reserved for the pathetic sidewalks we have now could be populated with strategically placed bioswales which would collect more rain water to soak into the ground. The bioswales would need to be placed in such a way as to ensure that the water soaks into the ground and does not pour into people’s basements of course. We’re of course in a fiscal crisis, and rebuilding little used alleys is likely not on the table for a while. 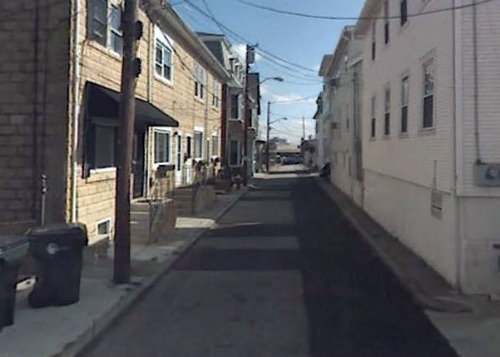 On Federal Hill, most of the alleys are simply linear potholes and they will have to be rebuilt at some point. When that time comes, we should consider Woonerfs rather than trying to jam a typical street into an area that cannot support that kind of infrastructure. I like this idea in theory, but wonder just how practical and safe it would be. I used to live on one of those alleys on Federal Hill. We never used the sidewalk because it was just too narrow (and actually had “no parking” signs on it as if cars thought a road that was only 1 car wide would be good for parallel parking). Most of the alleys on Federal Hill are used for quick speedways by the valets on Atwells. Throw in pedestrians and you’re looking at a dangerous combination. The valets show no regard for anyone or anything but themselves. I know it’s not an excuse, but it happens. One word: Valets. I agree with RunawayJim, they don’t seem to care a whit for their lives or the lives of anyone else. But if you have a hankering to rent a jackhammer and build a bioswale on your street let me know, I love a good excuse to work with power tools. place bollards, trees, whatever, in a staggered pattern (zig-zagged) to physically prohibit speeding? Seems like the rehab of those alleys would be a great public/private partnership with some of the non profits, environmental groups and CDCs. But in looking at the one in the picture, i can’t help but wonder whether the folks who own property on either side didn’t encroach somehow with their fences? Yes, that is my thought exactly Thomas. We have “sidewalks” now and the valets scream up the alleys (by the way, I tell everyone I know, don’t ever valet your car on Federal Hill if you care at all about it). I would argue, that the sidewalks, such as they are, encourage the speeding. The valets (and others) have a place to chase the pedestrians to to get them out of their way. It sends a message that, you, pedestrians belong there, on the sidewalk, this, the road is for me, a car. The roadway could have humps to divert water into the bioswales, other grade changes to slow traffic, and plantings and bollards to change the geometry of the street, forcing drivers to take note of what they are doing, and slow down. This area, Jones, Mountain, and Bond Streets is really neat actually, I should walk around there more often. It is like Europe or Nantucket or something.